The Nissan GT-R has a sophisticated all wheel drive system called ATTESA. The ATTESA system uses a set of clutches in the transmission assembly to send power to the front wheels. Severn Valley Motorsports have come up with a defeat switch for the ATTESA system, and in this video, they put it to the test with a little burnout in a 1200 horsepower R35 GT-R. Subtle is not this car, nicknamed "The Hulk". 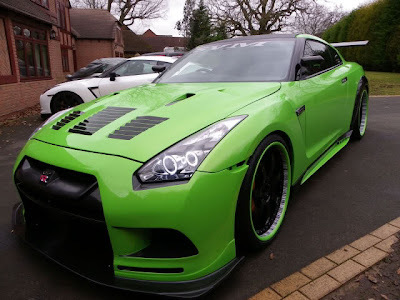 The UK GT-R forums have a huge thread on the car build. It was great to see that they removed the hideous lambo doors. The green is a bit over the top, but it is a demo car, and you want it to stand out. Check out the video and spec sheet after the jump. Top Secret Front Towing eye for Track use.